Once upon a time, I had a particularly wonderful group of Intro to Public History students. We were working with the idea of memoir as public history. As a lark, really, I asked them to write their life story in six words, no more no less. The idea came from Smith Magazine and we all found it to be really compelling. So compelling, in fact, that we decided to involve our campus in the process. My students got hundreds of students involved. They shared their experiences, from the mundane to the sacred and everything in between. As public historians, we grappled with how to curate, to care for, other people's stories. We came up with creative ways of getting people to contribute and we took turns gatekeeping content and dealing with difficult memoirs, painful ones, angry and sad ones. We talked and debated and ultimately designed a series of arresting exhibits all over campus. You can see them here. From kitchen staff to the Vice President, so many members of our community got involved in the project. Students turned out to help us erect a public art installation, a living breathing web that blew in the wind and brought movement and life to our shared stories. It was a beautiful project. 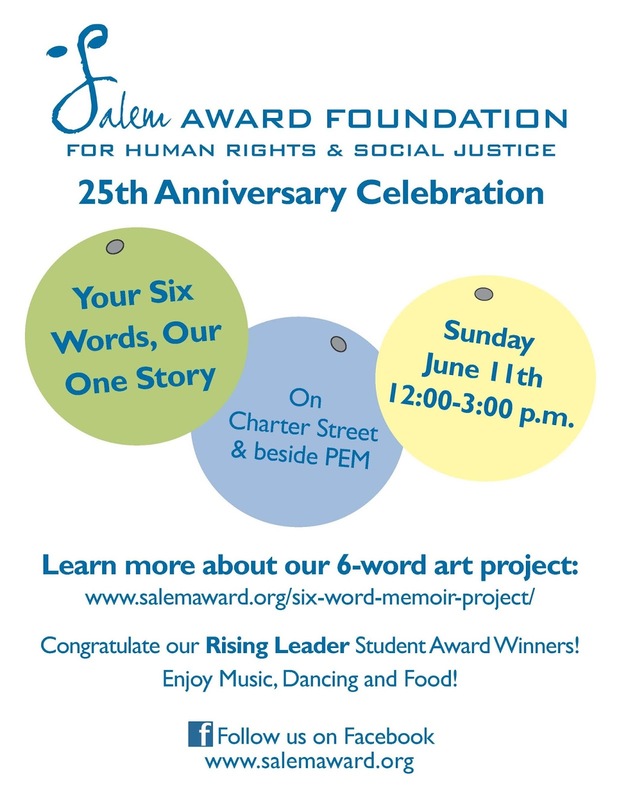 This is why I am so happy that the Salem Award Foundation is bringing it to the City of Salem on June 11th. Residents of all ages, classes and creeds will come together to share their stories. In six words, no more, so less. I went to numerous conferences this year. It was a nice perk of being a fellow at the Collaborative for Southern Appalachian Studies. Sharing my work on participatory cultural memory, I was on panels with literary theorists, social workers, psychologists, planners, musicologists and geographers. 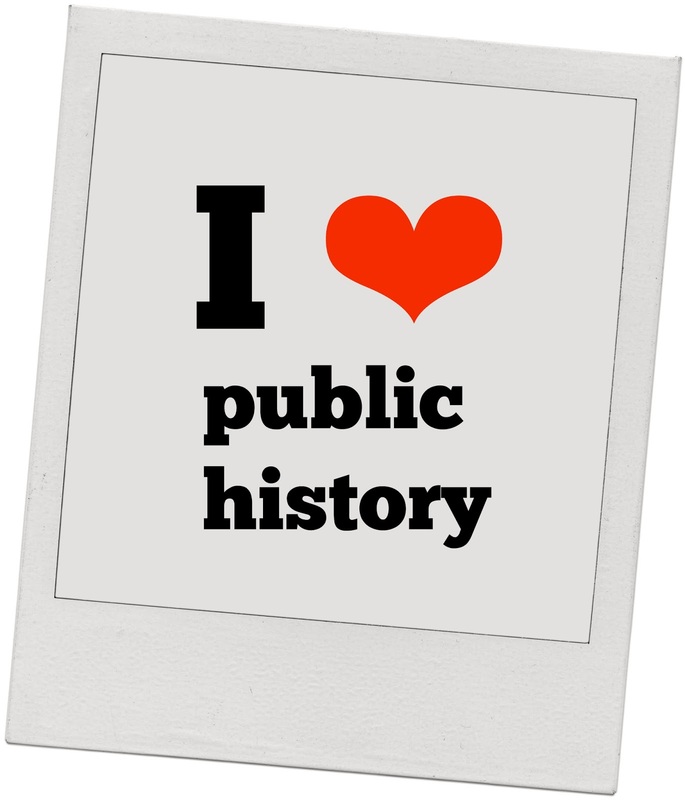 Traveling outside my academic "home" of public history was a learning experience for me. I love my sub-discipline and have long been a booster for public history as a rich community of practitioners and scholars. When one of my students attended her first National Council on Public History annual meeting a few weeks ago in Indianapolis and declared of attendees, "I can honestly say these were the most supportive people I have ever met in my life," my reaction was, "Yes - of course. That is who we are." Our project, the Places Project, got featured on the Sewanee website. It is always strange to read an effort to try to capture something that for you is fluid and so very much alive -- even a great piece like this. The Places Project is in my bones right now. I am not ready for it to be static, but I am ready for the word to get out there about it. I was nervous. Standing backstage immediately before giving the student commencement address at the University of Pennsylvania's College of Arts and Sciences graduation, I was gulping air and peering out at the thousands of people in the audience. Eric Schneider leaned in conspiratorially and said, "If it makes you feel better, in the scheme of things, you are just an infinistimal speck of dust. We all are." A few months later, Eric sent me a typed letter with a handwritten note. The letter was one recommending me for an internship. The note said, "Everyone should get at least one chance to read their eulogy while they are alive. Here's yours." 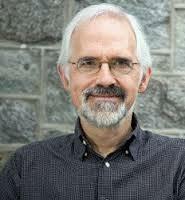 I went to a spatial humanities workshop last summer at the National Humanities Center. The best thing about the three-week seminar was the opportunity to spend time thinking and talking with artists, political scientists, philosophers, literary theorists, language experts and, of course, my fellow historians. And here we've been, thinking postmodernism and poststructuralism lend themselves to enacting liberatory possibilities. Multivocality and multiplicity should bend, ultimately, to more nuanced, inclusive, democratic representations of experience and of history, right? Forget that "hegemonic narrative." Let's have alternatives! Following folklorist Henry Glassie's observation that countermemories are often the "resort of people who feel removed from power, the imagination’s parallel to armed resistance," it's been common to applaud the prism, the fragment, the partial. We liked the non-totalizing, we embraced the variabilty of variousness. In the past few months, and certainly since the inauguration of Donald Trump, we have been privvy to the slide of facts. Facts have been portrayed as simply a matter of interpretation. This means, in a sense, there are no facts. 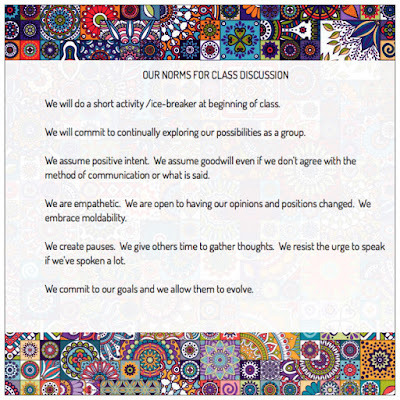 I am sharing these class discussion guidelines because I think they are great. My students arrived at them after a conversation about what makes group discussion helpful, productive and energizing. They also asked me to make them lovely and to share them on Blackboard so everyone has a copy. I am hopeful that they will guide us as we learn together this semester. Tiffany Martinez didn't need to add the "white" to her statement that "academia needs work." She experiences the power and exclusion of whiteness all the time. For her, the academy is white. I hope you've already read her piece, Academia, Love Me Back, but if you haven't, you need to. Anyone working in the academy needs to. White people need to. I needed to. I know, from my own experiences and my own mistakes, that the worst injury a professor inflicts on a student is the false assumption that work they have submitted is not their own. That is what happened to Martinez. 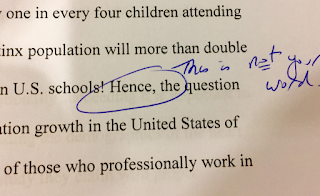 She used the word, "hence" in an essay. 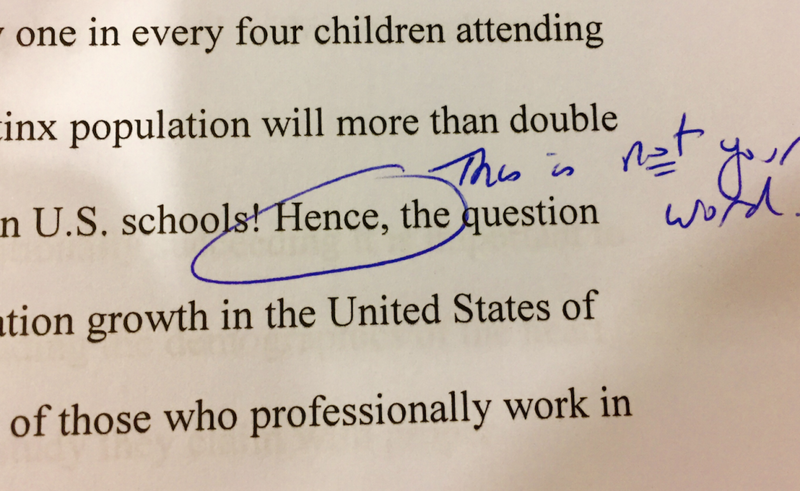 Her professor insisted that this was not her word. They underlined "not" twice. As in, "no freaking way do you know this word." Not to mention this young woman is a serious scholar and can probably out-write every kid in that class. The damage we can wreak as professors by making assumptions about students, about their writing, about their ideas is tremendous. As Martinez notes, it can set students back, as their own doubts and feelings of not belonging are codified and wrapped in the mantle of authority. Of knowing. Look, Mom! Margo on TV! I had the total pleasure of being on GCTV6 this morning, talking about the Places Project, Monteagle Homecoming and the importance of local and community history. It is one of the most iconic photographs of the twentieth century. I would argue that for many, it tells the story of the American war in Vietnam, or the Vietnam War, more eloquently than any other image. The picture is often called simply, "the napalm girl." And Facebook decided to censor it. Because the child depicted is not wearing any clothes. Because she was burned so badly that she was basically on fire.